scans_daily | Noscans - First look at Brie Larson as Captain Marvel. 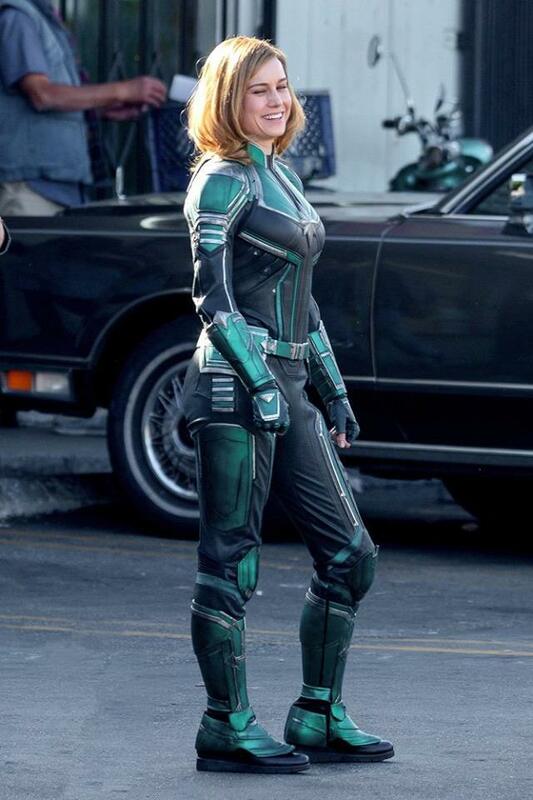 Noscans - First look at Brie Larson as Captain Marvel. And the colour scheme is not what we might have expected! Looks similar to the color scheme Mar-Vell originally started out with. It'll probably change during the course of the film. Yeah, this looks like it might be Kree armor of some sort, which might get customized once we work out how big jerks this bunch of Kree are. Odds are looking pretty good. Glenn Close called their Prime Minister a prick, so probably. ... actually kinda like it. It's a nice way to homage the traditional Kree uniform, for one. Though I'm gonna raise the bet that at some point she'll change to red, blue and gold. She's... Looking kind of young? Maybe it's just me, but I always figured Carol to be slightly older. Mid-30's rather than late 20's. this is set in the nineties. Kinda reminds me of Ultimate Captain Marvel, really. It is very much in line with the current visual paradigm for movies in general, and certainly for female characters in action movies. It would be kind of funny if after all this time Marvel trying to make NuCarol's look a thing that the MCU changes it and then the comics have no choice but to follow suit because of synergy. But she'll probably get the red and yellow afterwards. Knowing Marvel they'd probably do a flashback claiming Carol tried wearing a green and white (but mostly black) outfit early on in her Ms. Marvel days, which she conveniently has never mentioned or thought about before. Didn't she start out Ms. Marvel as kind of a Jekyll/Hyde thing where they didn't know they were the same person? If they went that route, she could literally say she forgot. Why not? She's literally forgotten everything else in her life. Like twice. Wasn't she retroactively Sentry's sidekick too? That was technically a different dimension (Earth-1611), although I wouldn't mind of Age of the Sentry was actually canon. With the retcon of Voyager's existence in No Surrender, maybe Carol will get retconned again as Voyage Girl. eh. that's like the most minor of changes they can make, and the easier to reverse, too. I am also expecting them to completely retool whatever her series is right now. not because of Synergy, mind you. but because that has been their MO when it comes to Carol in the last five years. I can live with the suit as is, especially as it looks more functional than a spandex suit. But I am super bummed that she doesn't have shorter hair. Maybe she'll get comic-Carol's hairshifting powers? Huh, good design, surprised by the green! After a quick google search, it says Brie Larson is 5'7". Respectable height. Okay, so why the two inch rubber pads on the bottom of the boots? My hope is that it will eventually create a lifts arms race that sees RDJ teetering on KISS-style platform heels. Maybe then he can look Chris Evans, Hemsworth and Pratt in the eye.